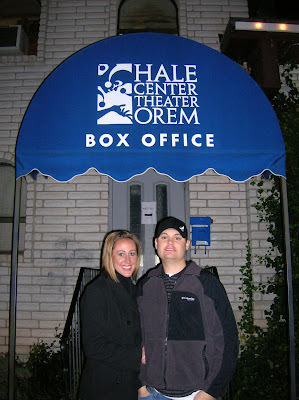 Last Christmas Mike's parents gave us one of our favorite gifts of all time-- season tickets to the Hale Center Theater in Orem. Mike and I have always loved attending cultural events like plays, musicals, museums, art shows, etc. and so we were absolutely thrilled! The best thing about getting season tickets is that it's a gift we've been able to enjoy all year long. After the play we went back to Mike's parents house to pick up Bryson and I cannot tell you how cute it was to walk in and see Bryson and Nonni (Mike's mom) both in their PJ's jumping around on the couch together. It was the cutest thing (I wish I had taken a picture of it). Bryson has the best grandparents--on both sides--in the whole world! He's such a lucky little guy.